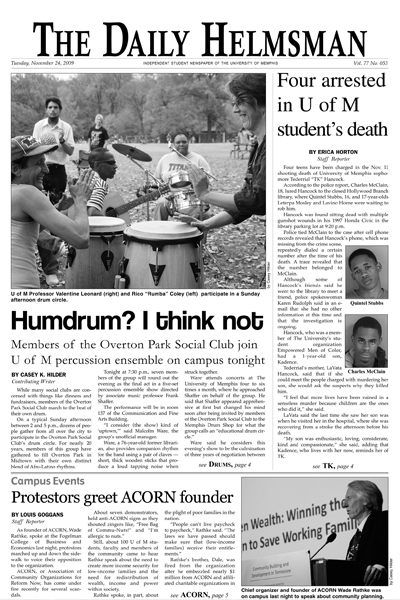 While many social clubs are concerned with things like dinners and fundraisers, members of the Overton Park Social Club march to the beat of their own drum. 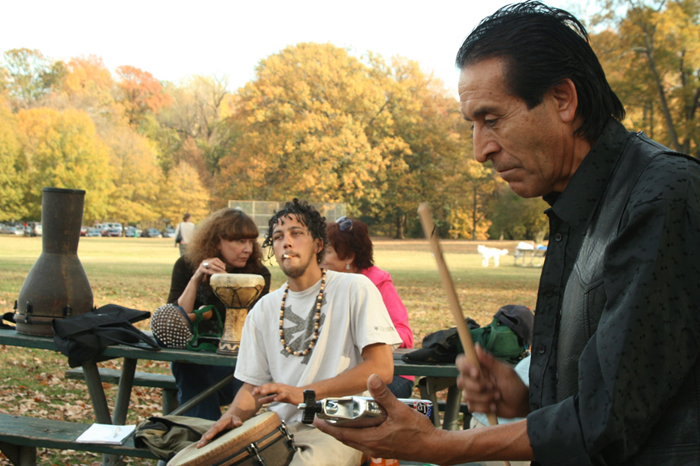 On a typical Sunday afternoon between 2 and 5 p.m., dozens of people gather from all over the city to participate in the Overton Park Social Club's drum circle. For nearly 20 years, members of this group have gathered to fill Overton Park in Midtown with their own distinct blend of Afro-Latino rhythms. Tonight at 7:30 p.m., seven members of the group will round out the evening as the final act in a five-set percussion ensemble show directed by associate music professor Frank Shaffer. The performance will be in room 137 of the Communication and Fine Arts Building. "I consider (the show) kind of 'uptown,'" said Malcolm Ware, the group's unofficial manager. Ware, a 76-year-old former librarian, also provides companion rhythm for the band using a pair of claves - short, thick wooden sticks that produce a loud tapping noise when struck together. Ware attends concerts at The University of Memphis four to six times a month, where he approached Shaffer on behalf of the group. He said that Shaffer appeared apprehensive at first but changed his mind soon after being invited by members of the Overton Park Social Club to the Memphis Drum Shop for what the group calls an "educational drum circle." Ware said he considers this evening's show to be the culmination of three years of negotiation between Frank Shaffer and the Overton Park Social Club. "For a while, one of (Malcolm's) dreams has been to come up and jam with the percussion ensemble," said Shaffer. Because the Overton Park Social Club performs nearly all of its songs without the aid of sheet music, Ware compared tonight's show to Brahms's method of gaining inspiration for his Hungarian dance pieces. The famous composer visited the countryside to take in influences from various Slavic folk songs that commoners played by ear. "Brahms, a trained musician, got quite an education from the untrained people," Ware said. "So it seems Dr. Shaffer is going to 'pull a Brahms' and allow us to play." The leader of the Overton Park Social Club is Rico "Rumba" Coley, a Puerto Rican immigrant who arrived in the U.S. in the 1980s. Known in some local circles as "The Blues Drum King," Coley has played alongside musicians such as the Doobie Brothers, Lionel Richie and Memphis' own FreeWorld. As the man behind the Sunday afternoon jam sessions, Coley said he enforces only two rules. "One is respect. You have to show respect - especially towards the ladies," he said. "Two: You got to have a hell of a fun time." Another member of the group is Valentine Leonard, part-time women's studies instructor at The University of Memphis. 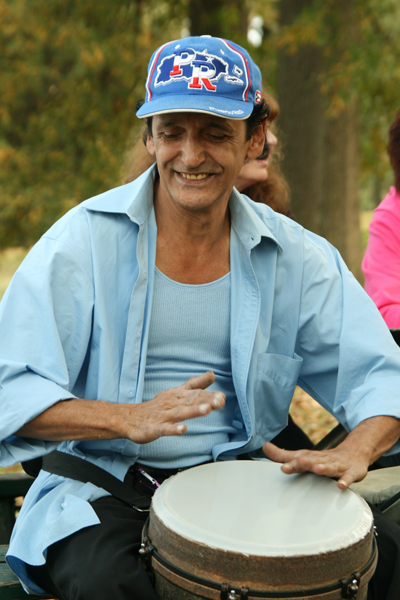 Leonard, who originally hails from France, has been with the drum circle for the past eight years. She is referred to within the group as "Rico's right hand." The nickname is a perfect fit, as Leonard can often be found working alongside Coley on the opposite end of a large set of djun-djun, a two-headed drum sometimes used by a single musician. 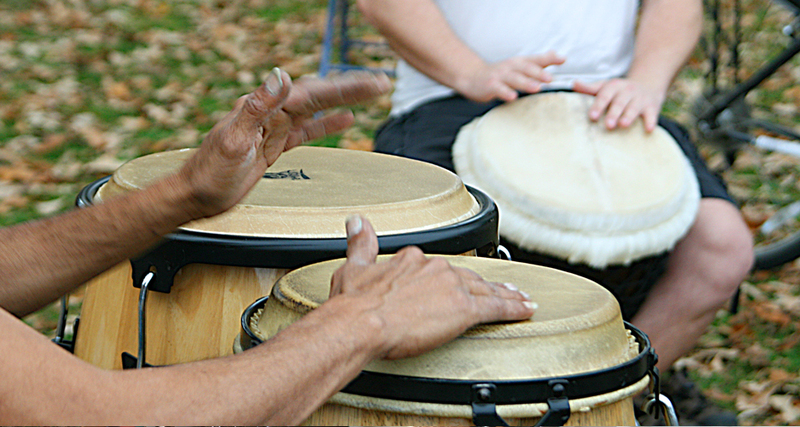 While sessions at the park often draw anywhere from 10 to 20 drummers, the group's numbers have been temporarily trimmed to allow for a cleaner sound, according to Coley. However, he invites any and all who are willing to join the group on Sunday afternoons. "Anybody who wants to can come down here," Coley said. "If anybody can kick it with the beat, they're welcome - they just have to deal with me."